For reasons best known to the Hellenic Federation the competition was played over two weekends. 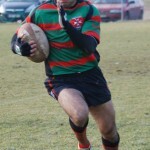 In May Rhodes travelled to Domokos, where they won all five games to lead the table by four points from Athens Spartans, Thessaloniki Lions and Athens RFC. This was all repeated last Saturday in Athens with each club playing the other and the top four then going into the semi-finals. The job was made slightly easier when Lions failed to arrive, leaving each team with four games before the play-offs. Colossi kicked off against Athens and tries from Scott Shaw, Red Newberry, Pantelis Arfaras and Gio Puckorius, who added two conversions, saw them to a narrow 24-21 victory. 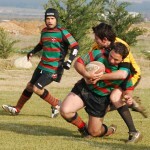 Meanwhile Iraklis were looking dangerous with victories of 22-17 over Springboks and 19-7 against Spartans. 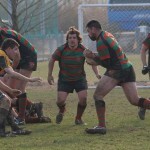 Spartans had impressed in the first round to finish second, but they were far from impressive against the Colossi in the next game as the Islanders steamed to a 36-0 win with two tries each from Shaw and Dimitris Kefalas and others from Newberry and Chris Panagiotopoulos, with three conversions from Puckorius. Spartans lost their third game too, beaten 17-10 by Springboks before Colossi met Iraklis in the clash between the only two sides so far unbeaten on the day. It was a close-run thing before the Colossi came out on top, 17-12, thanks to two tries from Newberry, one from Shaw and a conversion from Puckorius. St Lawrence College hosted Campion School yesterday (Friday 27 March 2009) for the first ever 15-a-side rugby match played between schools in Greece. Campion is coached by George Psaromatis and captained by Dimitris. They are a new team and were playing their first game. 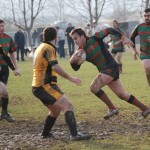 St Lawrence is coached by Liam Bellamy and captained by Nick Pople and has been playing for years. With their experience and depth on the bench, St Lawrence won 48-0. The players were 15-17 years old. Ted Cypiot refereed the game which was played by both sides with good sportsmanship.